Not having a kitchen in our room at the guesthouse is a blessing and a curse. In a way it is nice to hot have to cook, but being reliant on restaurants or the guesthouse kitchen (their idea of a “light meal” is fish and chips) is a burden on both the wallet and the bathroom scale. Not that we have a bathroom scale. Not that we’d even comprehend our weight in kilograms. We’ve been trying different kinds of prepared meals from Woolworths, and most of them have been pretty good, but our tiny fridge just can’t keep us stocked up all the time. So, if we aren’t fortunate enough to be out with friends at a restaurant, we rely on our new friend, Mr. Delivery. The other night, having already had decent Chinese and bad pizza deliveries, and seeing that we were feeling adventurous, we decided to order traditional African food from a restaurant called Homebaze. Many of the dishes on the menu were from South African cuisine, but there were several offerings from other parts of the continent, especially East and West Africa. I say this like I know what I’m talking about. We had no idea. Indeed, we spent half an hour Googling things like garri, amala, chakalaka and isi-ewu. Actually, isi-ewu was very clearly described on the menu as “goat head delicacy.” Scratch that one. We decided on the pap and morogo, the eba garri with vegetable soup and the black eye bean stew with dodo (fried plantain). We were told it would be about an hour. A goat head, thankfully, it was not. Instead, staring back at us from inside the Tupperware was a steaming bowl of tripe. Uh, definitely not what we ordered. Another of the containers had giant hunks of meat in an oily, red stew. Again, not. So, we called Mr. Delivery. This is not what we ordered, we said. What did you get, they asked. Well, one dish is tripe and the other is a meat stew. Yes, baas, we put the meat in there for you. But we did not want the meat. We ordered the vegetable soup. We put the meat in there for you, baas. 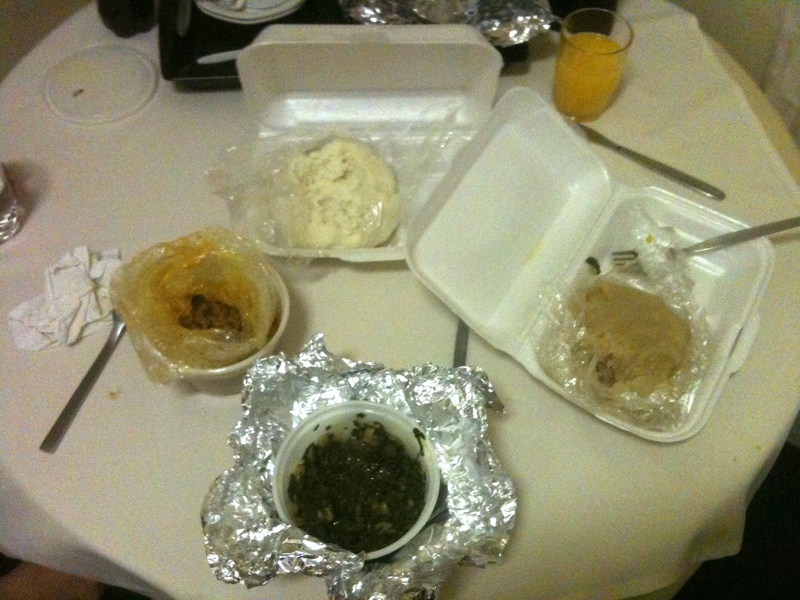 The remaining dishes, the pap and morogo and the black eye bean stew, were actually quite tasty. The pap, by the way – for those of you who made it this far without clicking the earlier link – was like a very dense polenta. It’s completely bland, but meant to be eaten along with the main dish as a sort of meal stretcher. A starch to accompany a protein. Those two dishes we would probably order again, should we get a hankerin’. Despite the glitches, I’m glad we ordered that food. By the way, all this talk of food from Eastern Africa delivered to our guesthouse seems callous considering the horrible famine and food crisis currently gripping that part of the continent. The situation is particularly bad in Somalia, as parts of the lawless country are inaccessible and millions of people are seeking to cross the borders into neighboring Kenya and Ethiopia. Please consider making a donation to an organization like the World Food Programme. I don’t have a job right now, but I managed to kick in $25. After all, I’m sure we spent more on Mr. Delivery. The ads posted by Google when I read your posting were interesting. I was happy to see that “Drought in Africa” (mercycorps.org) was first. Next up was “Great Tasting Biltong” available in sticks or sliced and USDA approved from africanhut.com. And then … White Castle! “Easy Online Ordering” “Try something Unique and Delicious”. it this makes you feel any better, I had lunch at Masala Wok the other day, as I was trying to find a compromise between a lengthy and tasty lunch and a fast-food meal. Masala Wok is some sort of wanna-be Indian food joint which, despite its name, does not focus only on Indian fare but it offers itself as an attractive Asian fusion alternative. First, being consistent with my carnivore instincts and wishing to enjoy a staple of Indian food, I ordered chicken Tandoori. Immediately I was told that, via a corporate-level decision, they discontinued that dish. Interestingly, the restaurant had a functioning tandoori oven and chicken tandoori did appear prominently on their menu. Following in the food steps of my pescetarian heroes (you guys), I ordered the vegetarian rice dish instead and 20 minutes later I got back chicken Pad Thai. So much for Indian, so much for a timely compromise and so much for vegetarian. And no, the chicken had not been cooked in the tandoori oven. While I realize that my story pales in comparison to goat heads and tripe, I still hope that I managed to remind you that, food-wise, the options are not all that much better on this side of the ocean. Ok, the tripe I can understand. But … having witnessed you kill muchos tacos de cabra during Buen Provecho – I’m a little surprised to hear you didn’t go apesh*# on the goat head. Come to think of it, I’m also surprised that Mr. Delivery didn’t have an actual apesh*t dish on the menu. Hmm…food for thought! An excellent point made by you. I did go in for the cabra that one time. HOWEVER…I don’t think I want an entire goat head for dinner. Indie would kill me; she loves goats. I’ll ask Mr. Delivery about the primate poo-poo platter. But let me ask you this: If they have it, will you come over to see it? No, monkey poo poo wouldn’t do it for me, but I would come over to “research” those “part enlargement” posters all over the place – we need a new theme for the inappropriate jar and that might be just the ticket.